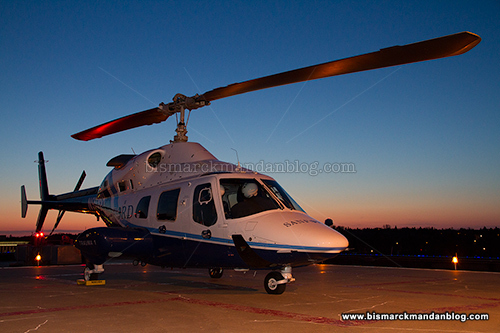 I’ve always been a fan of the Bell 222/230 helicopter models, because I was a fan of the TV show “Airwolf” as a kid. So when I got to shoot photos and video of the launch of the then-upcoming Sanford AirMed aircraft as a second shooter for a colleague, I was all over it. Too bad they couldn’t round up the rocket pods and chain guns from the TV model! Unbeknownst to me, my wife had taken our little boys for a McDonald’s treat to watch Daddy on the roof of the hospital as the helicopter came in on approach, hovered, took off, landed, and that sort of thing. I found out about that later. A few nights prior they’d seen me at the Bismarck Civic Center, running a camera for the monster truck show. Not to insult mailmen, but I thought monster trucks and helicopters would have ranked a little higher! Oh well, I guess maybe I needed a dose of humility. What better to deliver it than the unguarded utterance of a child? This entry was posted in Family & Friends by Clint. Bookmark the permalink.